Did you accidentally spill water or some other kind liquid on your MacBook? Accidents happen. Trek PC can help do water damage repair on MacBooks. We do all our repairs in house and they can range anywhere from $100 – $550 depending on the extent of the damage. Ever wonder “gosh why is there no MacBook water damage repair near me?” Well, wonder no more. We’re conveniently located at 4339 Dunbar Street (Dunbar & 27th) and are open 6 days a week. No appointment necessary. Trek PC has extensive experience doing liquid damage repairs on MacBook, MacBook Pro & MacBook Air. We repair your logic board in-house with our own specialized equipment. We’ve all heard about the rice trick for when you get your electronics wet but did you know that drying out your MacBook could actually cause more damage to it? While it is true that rice will dry out the liquid in your MacBook, that is not what you want to do. Electronics and water do not go together. When water (or any other kind of liquid) runs through an electronic component it creates oxidization which then leads to corrosion (aka rust). This corrosion interferes with the ability of your MacBook to function. 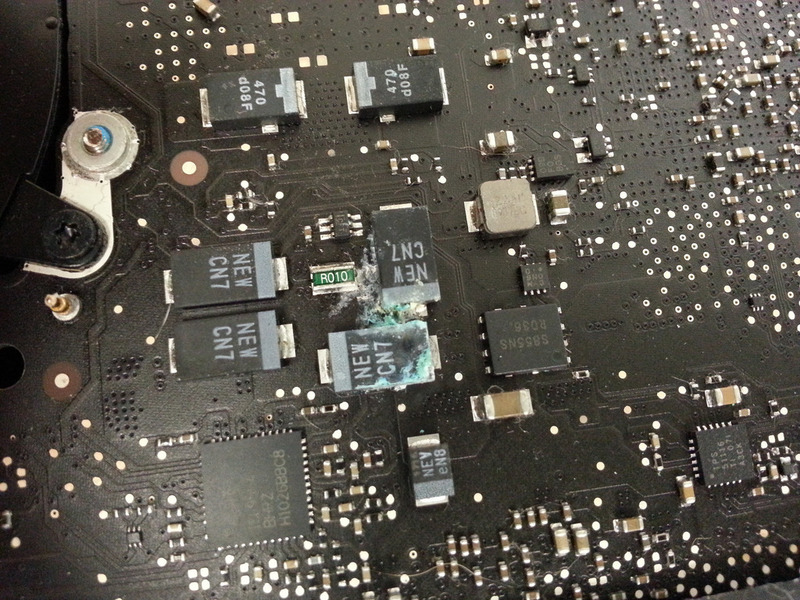 At times this corrosion could damage your logic board on a microscopic level leading your MacBook to stop working. MacBooks are sophisticated machines that contain an incredible array of sensors to provide the system information to properly operate. In some instances, your MacBook might turn back on after a liquid spill but you will notice that it’s either running incredibly slow, or the fan is spinning much louder than it should be. This is usually caused by damage to the sensor responsible for providing temperature & voltage information to the system. There is no need to worry if you’ve accidentally spilled liquid on your MacBook though since Trek PC can help you restore your MacBook to its former glory. Our experienced technicians know how to get rid of the corrosion and test individual components of your logic board to ensure that everything works properly. 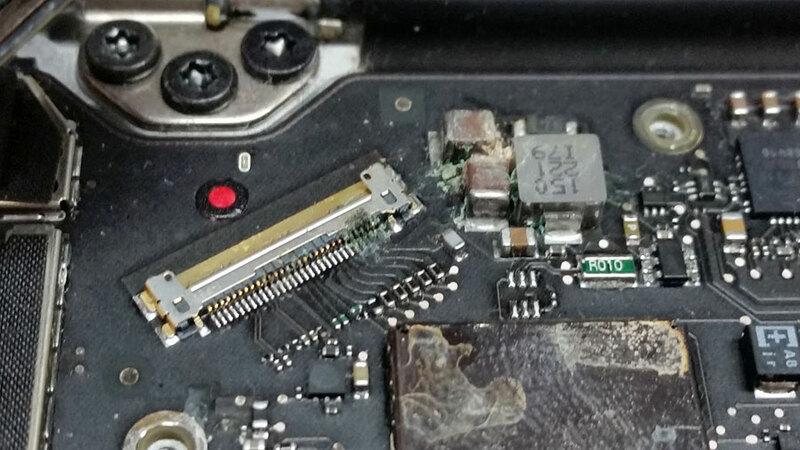 This can involve cleaning your logic board with an industrial cleaner and replacing the damaged components (transistors, capacitors, resistors, logic gates, amplifiers & more). We help tons of people like you fix their MacBooks every day because we are experts in this field. What should I do after a liquid spill? As soon as you spill something on your machine you should stop using it! Turning it on will make it worse; electricity and water cause corrosion like the board in the picture. Even when damage is this extensive, we can repair it, but it is best to minimize damage. If you are comfortable doing so, we suggest you pull out the battery. Do not try to turn on your MacBook because turning it on can cause a short inside the MacBook and make the water damage repair much harder. We also suggest that you don’t plug your MacBook into the charger after you have exposed it to water. Charging your MacBook in this state will also short-circuit it, making water damage repair very difficult and could also damage some of the internal components of your MacBook. Just bring it into Trek PC in Vancouver and we will have a look at it for you. Our initial diagnosis of the water damage (or any other kind of diagnosis) is free so you have nothing to lose by bringing it in. How long does the water damage repair take? We cannot guarantee a specific time period for the MacBook water damage repair service as every spill is different. Depending on our workload, it could take anywhere from 2 to 5 business days to fix the water damage. However, we aim to finish MacBook liquid damage repairs faster than that. What does water damage repair cost? We do not have a set rate for the MacBook water damage repair since every situation is different. We do all our repairs in house and they can range anywhere from $100 – $550 depending on the extent of the damage. Please keep in mind that the MacBook water damage repair is a highly specialized job to accomplish and that it takes many years worth of experience to be able to complete the repair successfully. A MacBook liquid damage repair at the Apple store can cost $840 – $1,340. We can guarantee that you will be paying much less than that with a faster turnaround time. Do you have questions about the MacBook Liquid Damage Repair?